In its first international concert tour, the Whitworth University Wind Symphony will travel to Costa Rica and perform at the university's new Costa Rica Center as part of the center's grand opening celebration. The ensemble also will perform and provide workshops at various other venues across the country during their spring tour March 17-22. After returning to the U.S., the wind symphony will perform their spring concert, "Pura Vida!" on April 1 at 3 p.m. at the Martin Woldson Theater at the Fox in downtown Spokane. General admission is $7; $5 for seniors age 62 and older; and free for students ages kindergarten through college. Tickets can only be purchased at the door prior to the concert. Internationally-renowned classical saxophonist Lawrence Gwozdz, who will accompany the wind symphony in Costa Rica and during the Spokane concert, will premiere the Concerto for Alto Saxophone, composed by Whitworth Professor of Music Emeritus Michael Young. 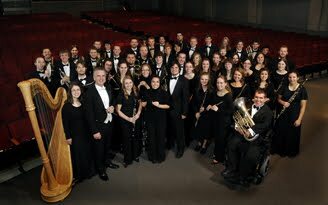 In addition to regular tours throughout the region, Whitworth's major music ensembles – wind symphony, orchestra, jazz, and choir – all undertake a major tour outside of the Inland Northwest once every four years. The wind symphony's last two major tours took place in Hawaii. Richard Strauch, professor of music and director of the Whitworth Wind Symphony, says he was looking for another location that was interesting and affordable for this year's tour. "When Whitworth opened the Costa Rica Center, we realized that this might be a great opportunity for us both to undertake our first international tour and to elevate the center's presence in the community," Strauch says. "The Costa Rica Center offers us a very affordable base from which we can travel around the country to perform." In a concert sponsored by the Costa Rican cultural ministry, the ensemble will perform March 17 at Morazan Park in downtown San José as part of a celebration called, "Enamorate de tu Ciudad," or, "Fall in Love with Your City." That evening, they will perform at Hotel La Condesa in San Rafael. The ensemble's performance at Whitworth's Costa Rica Center will take place March 18. On March 19 and 21, the symphony will perform and provide workshops and concerts for students at two music schools for students ranging from middle-school to high-school age in the cities of Desamparados and Puntarenas, respectively. The schools are a part of Sistema Nacional de Educación Musical (SiNEM), Costa Rica's national music education system, which has established around 30 schools to serve underprivileged and at-risk students. Founded in 2007, SiNEM was based on a similar successful program in Venezuela, "El Sistema." The workshops given by Whitworth wind symphony members will add a service-learning dimension to the tour, Strauch says. Whitworth recently began accepting music education students from SiNEM for intercultural placements at the Costa Rica Center, where they complete internships for class credit. The tour will conclude with a concert March 22 at National University in the city of Heredia, as part of that school's intercultural concert series. In addition to performing, wind symphony members will explore Heredia, the city nearest Whitworth's Costa Rica Center; the capitol city of San José; and the Pacific Coast. They will also zip-line in the country's rainforests. Whitworth's Costa Rica Center, which opened in 2010, offers an innovative cross-cultural studies curriculum. The center sits on a 27-acre property in the hills above Costa Rica's central valley, where just to the north lies Costa Rica's renowned Braulio Carrillo National Park. A short bus ride to the southwest is the city of Heredia, with a population of about 110,000, the main campus of Costa Rica's largest university, and abundant opportunities for family home stays, service-learning and cultural activities. For more information about the Costa Rica Center, please visit http://www.whitworth.edu/Academic/Department/OffCampusStudies/Programs/Semester/CostaRica.htm. The Whitworth Wind Symphony specializes in the performance of traditional and contemporary literature for concert band and wind ensemble, and presents several concerts on and off campus throughout the year. The group has been recognized as one of the outstanding college bands in the region, and it has performed at conferences of the Washington Music Educators Association, the Music Educators National Conference, and the College Band Directors National Association. Richard Strauch, director of the Whitworth Wind Symphony and professor of music, Whitworth University, (509) 777-4587 or rstrauch@whitworth.edu.